File Handles : Welcome to the VintageSaws.com Online Store! To complement our files, we also stock Skroo-Zon file handles. The importance of a properly fitted file handle is not to be taken lightly. Saw files in particular have very pointed tangs. One slip and you will soon find the sharp tang impaled in the palm of you hand. Safety First! Make sure that you have a proper file handle for each size file that you plan to use. These are not like ordinary file handles that work loose and fall off when you need them most. Skroo-Zon file handles feature a threaded, hardened insert which bites into the file tang just like a die stock. The result is a vise-like grip that is guaranteed not to work loose.The handles are made of seasoned hard maple, nicely finished and fitted with chrome plated bolsters. We stock the entire range which will accommodate any file that we carry in stock. In the table below you will find our entire file inventory matched to the handle that fits best. Since there are small variances in the tang of any file, there is a certain amount of "buffer" in the size tang that each handle will accept. In rare cases, you may need to grind a little from the tang to get a certain handle to fit. Since the tangs are not hardened, this is a quick and easy process. Simply put the tang into the handle as far as it will go and start rotating the handle clockwise. 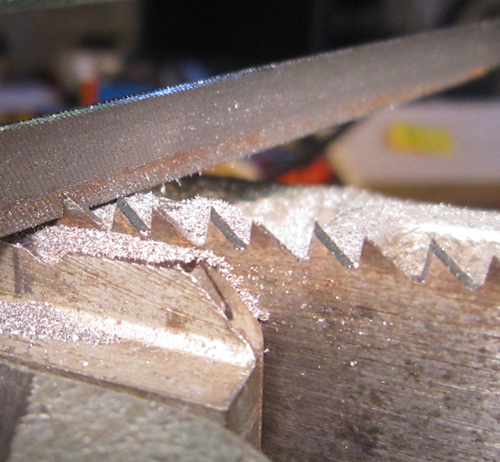 The hardened die in each handle will soon bite into the soft tang and self-thread itself down the tang. Keep rotating until the handle is secure. It won't come off until you reverse the process. These handles are so inexpensive, you'll want several of each size to have them fitted to all the files you commonly use. If you have files made by another manufacturer, you will see recommendations of the approximate length of file that the handle will fit. While we make no guarantees, the suggested lengths are generally accurate for most files. 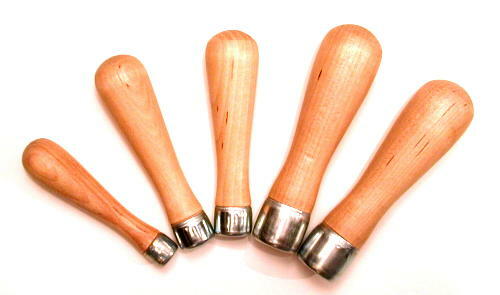 Order the whole set to insure that you always have a handle that will fit any file in your shop.